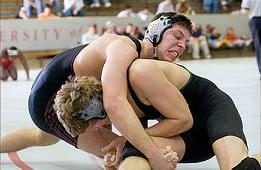 Amateur wrestling practiced at the college and university level in the United States. Collegiate wrestling is sometimes known as folkstyle wrestling because by and large, it is the style that emerged out of the folk wrestling styles practiced in the early history of the United States. This style, with some slight modifications, is also practiced at the high school and middle school levels, and also among younger participants, where it is known as scholastic wrestling. All of the terms are used to distinguish collegiate wrestling from the styles of wrestling practiced in other parts of the world, and from those of the Olympic Games: Freestyle wrestling and Greco-Roman wrestling.Collegiate wrestling, like its international counterpart, freestyle wrestling, has its greatest origins in catch-as-catch-can wrestling and, in both styles, the ultimate goal is to pin the opponent to the mat, which results in an immediate win. Collegiate and freestyle wrestling, unlike Greco-Roman, also both allow the use of the wrestler's or his opponent's legs in offense and defense. Yet collegiate wrestling has had so many influences from the wide variety of folk wrestling styles brought into the country that it has become distinctly American. The match takes place on a thick rubber mat that is shock-absorbing to ensure safety. A large outer circle between 32 to 42 feet in diameter that designates the wrestling area is marked on the mat. The circumference line of that circle is called the boundary line. The wrestling area is surrounded by a mat area or apron (or protection area) that is at least five inches in width that helps prevent serious injury. The mat area is designated by the use of contrasting colors or a two-inch wide line, which is part of the wrestling area and included in bounds. The wrestlers are within bounds when any part of either wrestler is on or inside this boundary line. The mat can be no thicker than four inches nor thinner than a mat with the shock-absorbing qualities of a two-inch thick hair-felt mat. Inside the outer circle is usually an inner circle about 10 feet in diameter, designated by the use of contrasting colors or a two-inch wide line, although this is no longer specified by the NCAA Wrestling Rules and Interpretations. Wrestlers are encouraged to stay near the center of the mat within the inner circle, or else they risk being penalized for stalling (that is, deliberately attempting to slow down the action of the match). Each wrestler begins action at one of two one-inch starting lines inside the inner circle that is three feet long. Two one-inch lines close the ends of the starting lines and are marked red for the wrestler from the visiting team and green for the wrestler from the home team.The two starting lines are 10 inches apart from each other and form a rectangle in the middle of the wrestling area. This rectangle designates the starting positions for the three periods. Additional padding may be added under the mat to protect the wrestlers, especially if the wrestlers are competing on a concrete floor. All mats that are in sections are secured together. Headgear, equipment worn around the ears to protect them, is mandatory in collegiate wrestling.Headgear is worn to decrease the participant's own risk for injury, as there is the potential to develop cauliflower ear. A match is a competition between two individual wrestlers of the same weight class. The match consists of three periods totaling seven minutes, with an overtime round if necessary if the score is tied at the end of regulation. The main official at the wrestling match is the referee, who is in full control in matters of judgment at the competition and is responsible for starting and stopping the match; observing all holds; signaling points; calling penalties such as illegal holds, unnecessary roughness, fleeing the mat, or flagrant misconduct; and finally observing a full view of and determining the fall. There can also be one assistant referee (especially at tournaments) that helps the referee with making any difficult decisions and in preventing error. Also, scorers are there to record the points of the two individual wrestlers. Finally, a match or meet timekeeper with assistant timekeepers are present to note the match time, timeouts, and time advantage and work with the scorers. Takedown (2 points): A wrestler is awarded two points for a takedown when, from the neutral position, he gains control by taking the other wrestler down to the mat in bounds and beyond reaction time. This is most often accomplished by attacking the legs of the opponent, although various throws can also be used to bring a wrestler down to the mat. Escape (1 point): A defensive wrestler who is being controlled on the bottom is awarded one point for an escape when the offensive wrestler loses control of the opponent while any part of either wrestler remains in bounds. An escape may be awarded when the wrestlers are still in contact. Reversal (2 points): A defensive wrestler who is being controlled on the bottom is awarded two points for a reversal when he comes from the bottom/defensive position and gains control of the opponent either on the mat or in a rear standing position. Reversal points are awarded on the edge of the wrestling area if control is established while any part of either wrestler remains in bounds. Near Fall: Near fall points are similar to the points awarded for exposure or the danger position in the international styles of wrestling, but the emphasis for near falls is on control, not risk. Near fall criteria is met when: (1) the offensive wrestler holds the defensive wrestler in a high bridge or on both elbows; (2) the offensive wrestler holds any part of both his opponent's shoulders or scapulae (shoulder blades) within four inches of the mat; or (3) the offensive wrestler controls the defensive wrestler in such a way that one of the bottom wrestler's shoulders or scapulae, or the head, is touching the mat, and the other shoulder or scapula is held at an angle of 45 degrees or less to the mat. The referee counts the seconds off. Only one near fall is scored for a wrestler using the same pinning combination, regardless of the number of times the offensive wrestler places the defensive wrestler in a near fall position during the situation. Near fall points are also known as "back points." Much of the criteria for the near fall was used in a former scoring opportunity known as predicament in collegiate wrestling. When near fall points are given after the opponent is injured, signals an injury, or bleeds excessively, it is a consequence of what is sometimes referred to as the scream rule. (2 points): Two points are given when near fall criteria is met for two to four seconds. Two points can also be granted in cases where a pinning combination is executed legally and a near fall is imminent, but the defensive wrestler is injured, signals an injury, or bleeds excessively before the near fall criterion is met. (3 points): Three points are given when near fall criteria is met for five seconds or more. After five seconds, the referee awards three points and stops counting. When a near fall criterion is met that is between two and four seconds, and the defensive wrestler is injured, indicates an injury, or bleeds excessively, three points are also awarded. (4 points): Four points are given when a criterion for a near fall is met for five seconds, and the defensive wrestler later is injured, indicates an injury, or bleeds excessively. Penalty (1 or 2 points): One or two points can be awarded by the referee to the opponent for various penalty situations. "Unsportsmanlike conduct" by the wrestler includes swearing, teasing the opponent, etc. "Unnecessary roughness" involves physical acts during the match that exceed normal aggressiveness. "Flagrant misconduct" includes actions (physical or nonphysical) that intentionally attack the opponent, the opponent's team, or others in a severe way. Illegal holds are also penalized accordingly, and potentially dangerous holds are not penalized, but the match will be stopped by the referee. Also, "technical violations" such as stalling, interlocking hands, and other minor infractions are penalized. With some situations, such as stalling, a warning is given after the first occurrence, and if there is another occurrence the penalty point is given. In other situations, there is no warning and penalty points are automatically given. In general, after a certain number of occurrences where penalty points are given, the penalized wrestler is disqualified. Win by Technical Fall: If a fall is not secured to end the match, a wrestler can win a match simply by points. If a wrestler can secure an advantage of 15 points over an opponent, then the wrestler can win the match by technical fall. A technical fall is very likely when one wrestler has great control over the other wrestler and is able to score near fall points repeatedly. If the 15-point advantage is gained while the offensive wrestler has his opponent in a pinning situation, the match would continue to allow the offensive wrestler to secure the fall. If the offensive wrestler is unable to secure a fall, the match ends once a near fall situation is no longer seen by the referee or when the wrestlers return to the neutral position. Win by Forfeit: A wrestler also may gain a victory by forfeit when the other wrestler for some reason fails to appear for the match.In a tournament, the wrestler could also win by a medical forfeit if for some reason his opponent becomes ill or injured during the course of the tournament and decides not to continue wrestling. For a wrestler to win by forfeit or medical forfeit however, he must appear on the mat in a wrestling uniform.The existence of the forfeit condition encourages teams to have at least one varsity (and one junior varsity) competitor at every weight class. The wrestler who declared the medical forfeit is excused from further weigh-ins but is eliminated from further competition.